Four Housekeeping Tasks to Safeguard and Improve your MusicMaster Experience | by Marianne Burkett – WELCOME TO OUR INTERNATIONAL SUPPORT! What is the most important thing about your radio station? This may be a point of discussion, but I’m going out on a limb here and say: “it’s what comes out of the speakers”. So, your music and/or on-air talent, sizzling imaging & community involvement is likely what makes the station so good? Yes? Good answer, we’re on the same page. 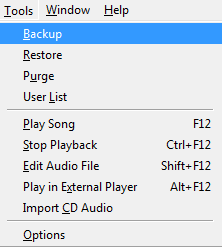 So, if some freak accident happened like lightning strikes, you trip over your power cord and fry your hard drive or your audio and data library in MusicMaster were completely wiped out, you’d be up the creek, without a paddle! Sometimes I will get an urgent call from a client indicating something is wrong, the database is acting funny, or the hard drive crashed or “whatever”. What is my first response? Generally speaking I will ask, “When was your last backup?” Trust me; my deepest hope is that you back up your database every single day. Backup to a flash drive, backup to a cloud server like Dropbox or the Google drive, backup to the network or take a standard backup and email it to yourself. Please, backup your data every single day and save yourself massive heartache, work, stress and OMG’isms in the future. You can just think of yourself in Marvel type terms, Ironman has nothing on you. You are the defender of your databases! Even with my incessant warnings about backups during our phone conversations…some folks (I’m not naming names)… just ignore it and procrastinate doing backups, or just don’t do them at all. It only takes 4 mouse clicks or 5 seconds, so please do it! How full is the drive on your computer that houses the program and the database? Go to Start/Computer… find the active drives…and right click and go to. 2) I have heard computer techs say if you have less than 15% available hard drive space – be prepared for a crash at any time. With the size of hard drives these days – we don’t see that much, but with older machines – it is very possible. What kind of processor are you running? What is your system memory like? How’s the performance? Do you frequently get a “white screen” while working in various programs? If so, you could have Memory and processor problems. 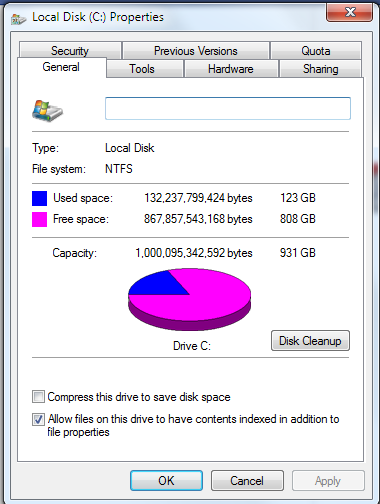 3) Check to see if your drive is fragmented. Click on the Tools tab the Properties area of the drive you’re looking at. 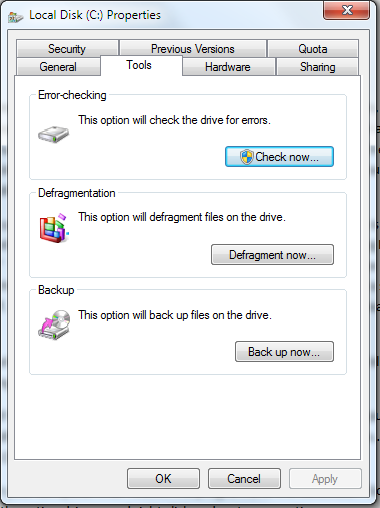 Make sure you’re scheduling defragmentation and external hard drive backups. 4) You can also check for errors. Can’t hurt to check! So besides general maintenance within the MusicMaster database – your machine or your server can also be a hidden source of issues.